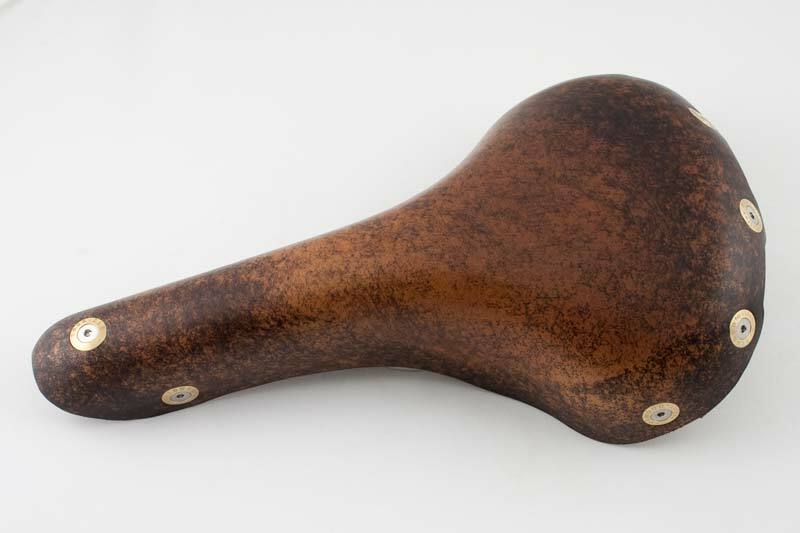 Many cyclists have used Brooks saddles for many years and loved them. But some of us have wished for something even better. Here it is. 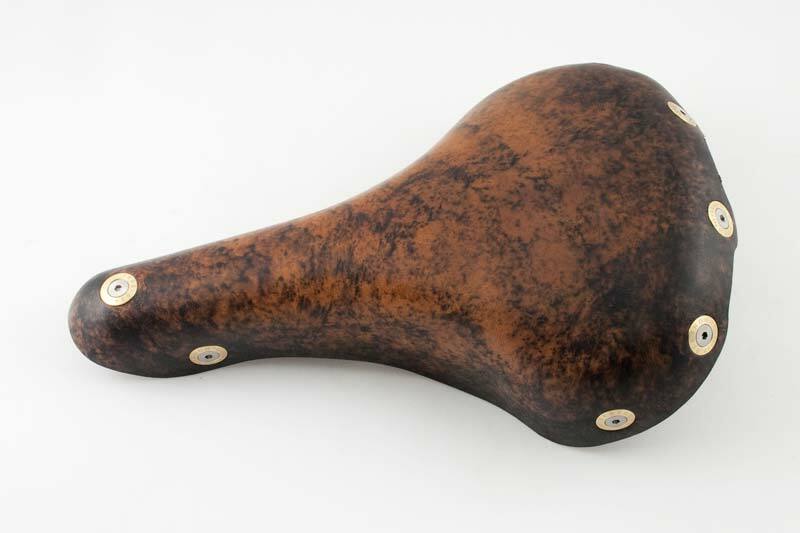 Gilles makes these beautiful saddles with top quality leather. Instead of riveting the leather saddle to the frame, these are bolted on, making it easy to repair if necessary. And the bolt assemblies at the rear of the saddle aren't on the top surface, where you might sit on them if you slide back on your saddle. But instead the bolts are off the bac edge, out of the way. The width across the back is 160mm. The men's version is just under 11" long. The women's is just inder 10" long. The bolts use a 2.5mm allen wrench. The saddles ship with no thread compound, and I have no idea if there's any tendency for the bolts to loosen while riding. My guess is they will. So if you notice the bolts loosening, a small drop of blue Loctite would be a good idea. Be sure not to use too much. Here's the underside, showing the rear frame, made of a special high strength plastic. 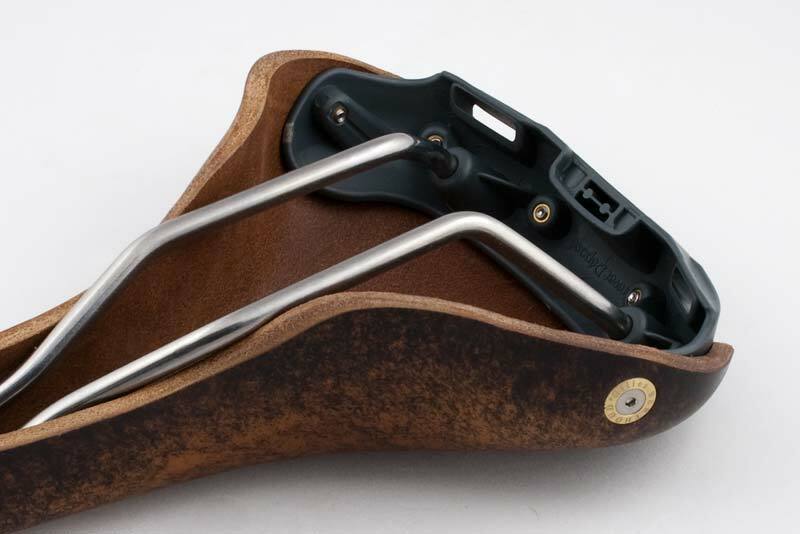 The frame has bag loops built in and even has a mount for KlikFix saddlebag connectors. 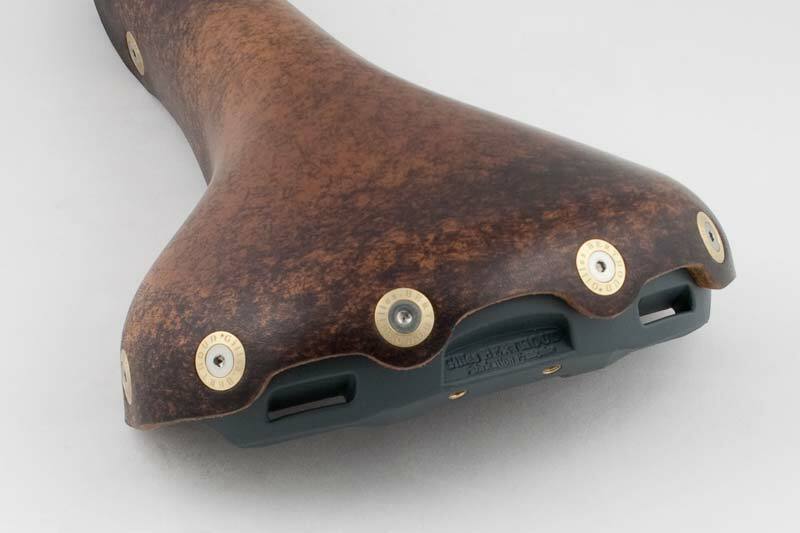 Saddle tension is easily adjusted with an allen screw at the front of the saddle. The rail positioning is the same as Brooks, so on most frames most riders will want a seatpost with setback. The front of the seat post's clamp should be on the centerline of the post itself. 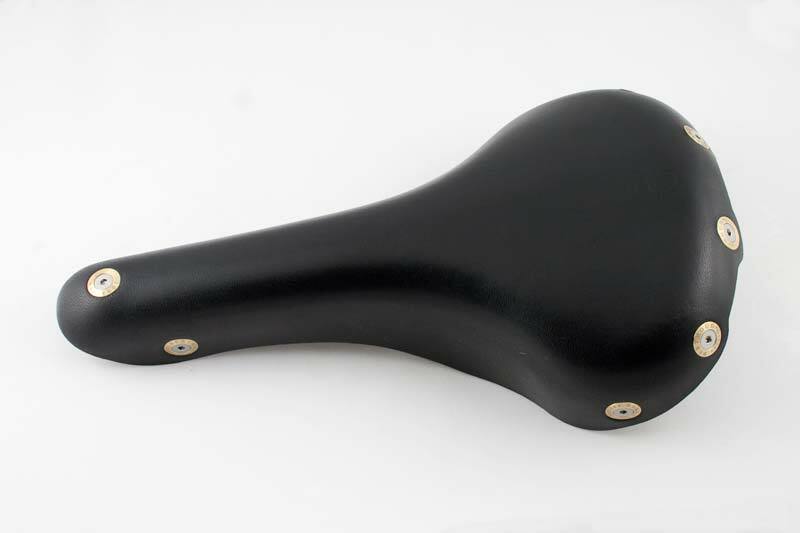 Given the shape of the frame and positioning of the bolts, riders should be comfortable sitting a bit further back on these than on a Brooks, so I expect that on long rides, this should be at least as comfortable as the slightly wider Brooks B17. The B17 measures 170mm wide. Gilles calls this his "Cork" finish. I don't know how he does it, but it looks gorgeous. Every saddle is different, of course. You can just see the screw holes at the bottom middle of the frame for the KlikFix attachment. They are sold separately, of course. And here's the Natural finish. Every saddle is a bit different. And here's the women's version, shorter by about 1" than the men's. Otherwise identical. We stock the women's in Black, Natural and Cork, (shown here in Cork). It's important to understand, that for women, a full leather saddle is either very comfortable, or a medieval torture device. Most saddles designed by and for women have a cutout in the center for a lady's tender bits. So, depending on exactly how the lady in question is constructed, she may love or hate this saddle. There's only one way to tell, and that's to try it. But there is no return possible on a used saddle, so it could be an expensive trial. You are of course welcome to try one here at the shop. It takes only a few seconds to know if it's suitable for you. A good rule of thumb is, the more miles you ride, the firmer the saddle you'll prefer. This applies equally to men and women. Sixty miles on one of these thick soft gushy saddles can be brutal. When your gluteus muscles are in good shape, you'll want the firm but flexible surface to sit on. And a leather saddle provides just that. 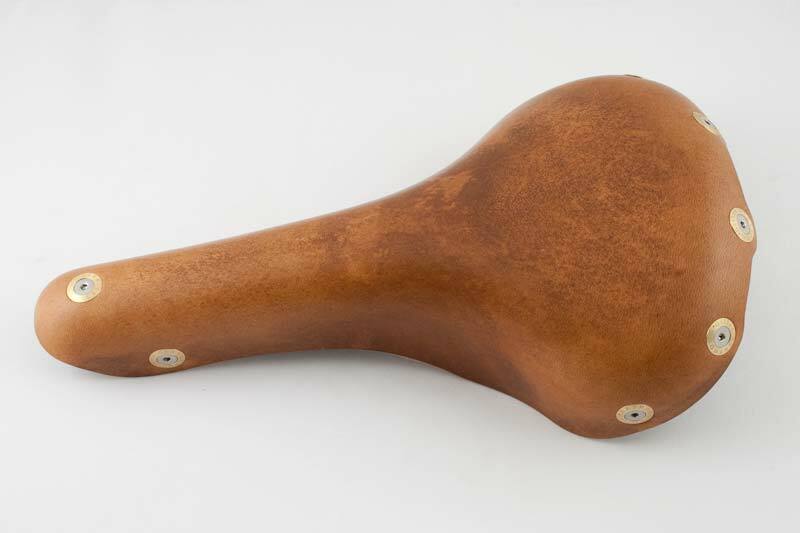 The issue for women is not the firm rear section of a leather saddle, it's the lack of a cutout in the center. Cutting a hole in the center of a leather saddle isn't necessarily the solution, since the edges of the leather can then irritate you. Bottom line is this: If you try one of these and your middle "tender bits" area is fine, but you feel like your sit bones are on something too hard, most likely you'll end up very happy with it, since the leather will soften up a bit, and you'll cause the leather to conform to your shape fairly quickly. But if your tender bits scream in agony, forget about using one of these. If my history selling saddles to women is a reliable guide, the majority of women will not like this saaddle, just as they don't like Brooks saddles. But, some women will love them, and never want anything else. 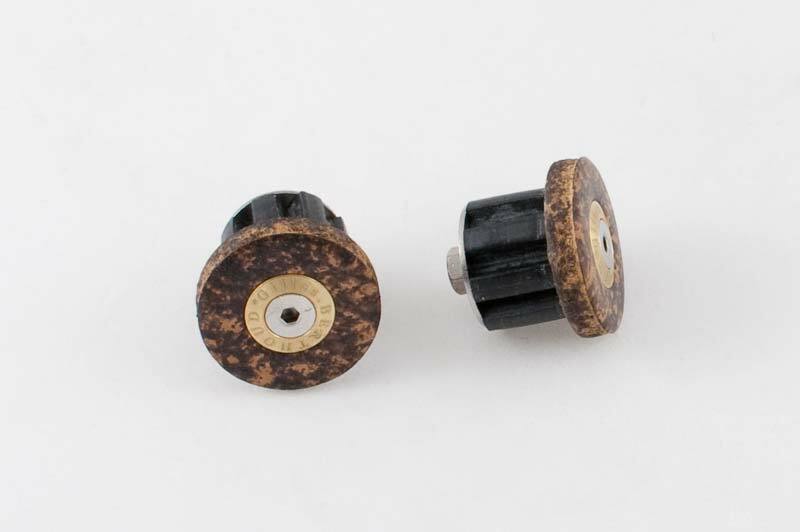 Matching handlebar end plugs are available in Black, Cork (shown here) and Natural. The plugs are made with the same leather as the saddles. I'll have prices for spare parts posted as soon as I get them. All parts will be available.